Flashes of Style: Go Chic or Go Home $50 gift card giveaway! Go Chic or Go Home $50 gift card giveaway! photo-sharing website that offers everything you need to make the most of your daily wardrobe and style: your closet, inspiration, friends and shopping. 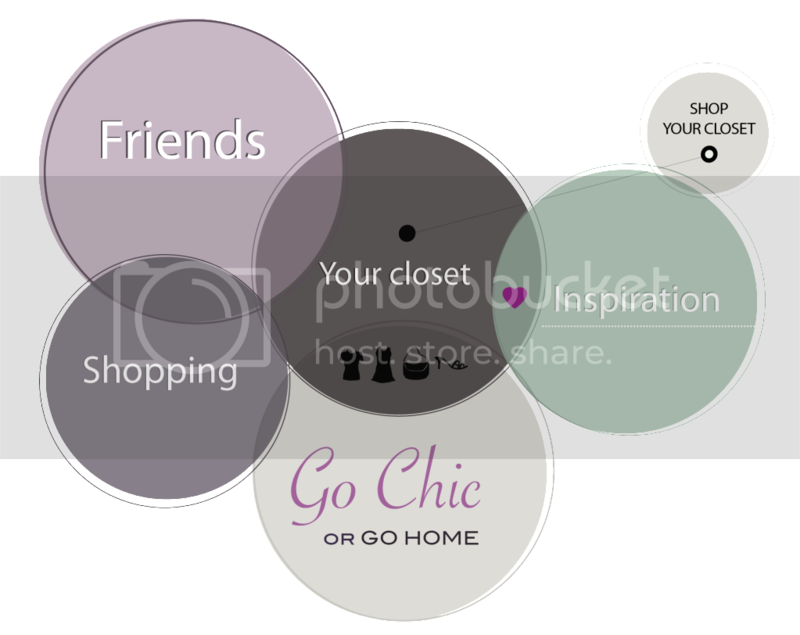 Through your own personal boards you can organize your own outfits, wishlists and styles you love! A pretty good idea if you ask me. Anyways, by signing up through the Flashes of Style invite, you will be qualified for a $50 giftcard voucher for any of the brands in their shop, including ASOS, Madewell, J.Crew, and more! Become a member of Go Chic or Go Home in 2 easy steps: 1) Request an invite here and 2) Use your invite link to sign up on the website. Leave a comment on this blog post about the Go Chic or Go Home community. What do you think? Existing members are more than welcome to enter the giveaway, too! Simply log into Go Chic or Go Home so that your account is active during the giveaway period. Open to international readers. Gift card will be issued in denomination specified by retailer. Good luck to all! I've signed up for GCGH and the organizer has been exceptionally sweet and welcoming! Go Chic or Go Home is really cool! I can't wait to start creating outfits from my own closet! Wow, interesting...just checked them out and I'm intrigued! Can't wait to see how the community develops! Go Chic or Go Home looks very cool! I love how it allows you to create outfit boards and read blog posts. I'm a member! I love using GCGH for inspiration when I have no idea what to wear. I've wanted something like this ever since I saw Clueless! Cher has the ultimate closet, perfect for making outfits without trying on every item of clothing. I look forward to living in the 90's again! Go Chic or Go Home is so nice, and a bit more down to earth than some other similar sites. I signed up today and am excited to use it! Just signed up. I really like the video tour! what a creative & fast way to get new comers on board! Just signed up - seems very cool! I just signed up! I really like this website, it is very different, and it is quite simple to use which is very good. It is also nice for getting inspiration and ideas for new outfits! just signed up! seems cool! Finally a place to find other red heads!!! It's sometimes so hard to style your clothes when your hair is so loud! I've been signed up with GCOGH for a little while now -it's wonderful! this site sounds really cool, i will definitely have to check it out, thanks for sharing! OMG! I love it. It's so cool, can't wait to upload my closet!!!! And it's supeeeer easy to do it! Looks like a fun way to organize my closet and hopefully get others opinions on how to style what i already own. I love browsing outfit inspiration there! I love looking for inspiration there. Love to be able to classify picture by colors, it helps a lot sometimes. I love GCOGH for organizing my closet and getting inspiration from so many stylish ladies! I just became a member. I love it! I think it's perfect to get inspiration, find new styles and try new things. looks like such a fun website....I can't wait to shop, explore, style & be inspired! just signed up.. interesting concept with lots of choices... it is like an interactive fashion closet! Looking forward to spending a bit of time there! just became a member. i am excited to check it out more and get inspiration! Signed up and ready to upload my clothes and get inspired! I joined Go Chic or Go Home recently & it's been fun to look around! I don't know if I would upload my clothes, because I feel like it would take too long! But, I will look to see what others have uploaded on the chances that we have similar pieces! Thanks! What a great idea, I can't wait to start shopping and organizing with Go Chic or Go Home! It's like a coupon book combined with Polyvore only neater! I love it. This site is amazing! Lots of fashion style inspiration! Great giveaway! I love that Cynthia replies to the users!!! The site is fabulous and is a great idea! I absolutely love the Go Chic Or Go Home Movement. im pretty indecisive so the GCGH website is an awesome and fun way to help me get decide what to wear. its fabulous. cant wait to shop and upload photos!! Thanks for hosting the giveaway! Love the blog! I love that they love cookies!! Seriously though, I love the idea of shopping from your own closet as they allow you to upload pics! I just signed up. Can't wait to start using it! I'm already a member of GCOGH, and I love it! I love the inspiration boards!!! I love GCOGH! It keeps me from overshopping when I have so much in my closet already. Great for inspiration. It's a great site to meet up with fellow bloggers and keeps me track of the latest fashion trends. I think GCOGH is an awesome way to keep outfit inspiration organized and to make it fun! I'm a recent member and love the site for all the inspiration it brings to my life.